The greatest returns of all time – among them are Michael Jordan to the Bulls in 1995, The Rock on WWE Raw in 2011, and Barack Obama’s approval rating in 2015. With the reunion of two of the original four founders and the addition of writer-producer Reginald Hudlin, the re-launch of Milestone Media hopes to be added to the list. Milestone was founded in 1993 by four Black trailblazers – Dwayne McDuffie, Denys Cowan, Michael Davis, and Derek Dingle – who wanted to help fix the severe underrepresentation of characters of color in mainstream comics. 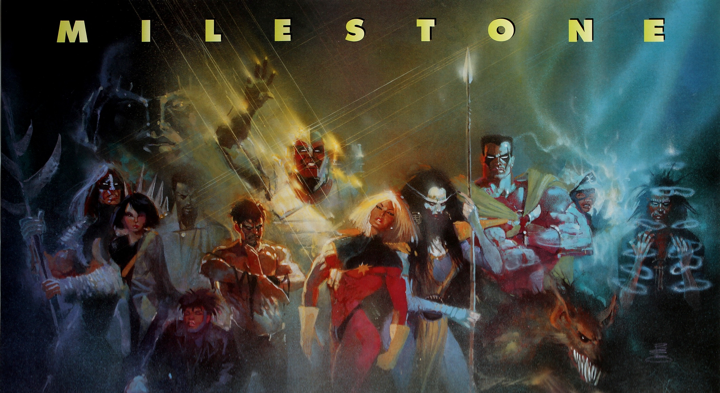 While they were published through DC Comics, Milestone kept full creative control over their characters, which was important in an industry that was largely uncomfortable with the perspectives of Black characters such as Icon, Hardware, and the team Blood Syndicate. Milestone comics pioneered the portrayal of Black super heroes for audiences, but even more significantly, they did so in a way that changed the comic book industry as a whole: they were popular. Their most popular character, Static, helped shatter the myth that characters of color would have narrow appeal, and after only one year of publication DC Comics created a crossover event with their Milestone imprint. “Worlds Collide” brought Static into DC continuity, where his character would later join the Teen Titans and star in his own award-winning animated series, Static Shock. With a bright future ahead of them, how did Milestone stop producing comics in 1997, just four years after its opening? Well, that remains eerily unclear. Speculation over the years has ranged from Milestone coming short of the sales boost DC expected – they were getting their butts kicked by Marvel after all, and needed to do something to compete – to DC scorning co-creator Dwayne McDuffie due to behind-the-scenes grievances. Some say DC only wanted to claim the character Static and so they let the rest burn. While most scenarios leave DC Entertainment looking like the obvious villain, the quiet forgotten truth is that Milestone comics were actually good. They were good-good. The readers who bought their titles praised them, and with proper marketing, the success of Static could have been only the beginning. That brings us to today. When news broke that Milestone would return I immediately tried to place them in today’s landscape of comics. Comics are much different now than in the 1990s, but how different? Independent artists continued making amazing and diverse characters of color without them, so should I really be excited? How well could Milestone thrive now that mainstream media is moving closer towards appropriately diverse representation? Comics and entertainment are rapidly changing as consumers are becoming more aware of the importance of representation, and companies are responding by giving them what they want. Here we are in 2015 and Ultimate Spider-Man and Captain America are people of color, Thor is a woman, and Barry Allen is in love with a Black woman and was raised by a Black family. The debate remains on whether this is short-term pandering, or if the conversion of previously White male characters towards broader representation is even worthwhile given the lack of original characters, but in an industry that is seemingly evolving it will be interesting where Milestone Media finds its place. Now in their return, there is more hype surrounding Milestone than ever before. Not only hype, but expectations for their success. Comics may have advanced in a way that seemingly spills into their market space, but digital marketing and promotion will allow a much further reach than they had in the past. All the 90s readers who lauded Milestone comics will have their opinions heard by more than their AIM contact list. Digital comics will make them more accessible for everyone instead of comic book shops being the gatekeepers to their success. A lot has changed, but a lot of the changes can be played to their side. Maybe more readers will plunge into Milestone than ever before. Maybe we didn’t realize what we had until it was gone. And maybe we’ll get to see the rest of the iceberg, if Static was only the tip of it.